Every lover of waffles loves their waffles some type of way. Having a good waffle maker makes it very possible and easy to bake your waffle the exact way you like it. The main problem now is deciding what makes a good waffle maker. There are different categories and manufacturers of waffle makers on the market. This availability of various choices means that settling for one can be a difficult task. Many people do not know what to look for in a waffle maker. The first thing is usually knowing your budget. There is a wide range of price among waffle makers, so you need to pick one you can afford. If you’re looking for one of the best waffle makers, keep reading. If you’re looking for the best waffle maker under $50, click HERE. The last thing you want is a waffle maker that will break after a few months of use. This is why you have to consider the durability of a waffle maker before making a purchase. If you are one for aesthetics, you should also look at the designs of waffle makers. Also, the ease of maintenance, repair and any warranty option should be considered. There is also the part where you settle for a brand. Some brands are known to produce quality appliances, so that could help in narrowing your choices. One such brand is Breville. This brand of kitchen appliances is very popular and operates in over 30 countries. Breville invests well in discovering new ways to improve the kitchen, and this is evident in its hundreds of patents. With origins in Australia in the 1930s, Breville was founded by Bill O’Brien and Harry Norville. Since then, Breville has introduced innovative and cutting-edge electric kitchen appliances, such as Breville BWM520CRN the No-Mess Classic Round Waffle Maker. Breville BWM520CRN the No-Mess Classic Round Waffle Maker is the focus of this review and it will be expounded upon. First, we will discuss the many features of this waffle maker. We will then examine the pros and cons of Breville BWM520CRN the No-Mess Classic Round Waffle Maker. The product’s ranking on Amazon will also be revealed. We will then proceed to compare this product to two other products in its same category. Frequently asked questions by customers will also be answered. So, sit back, because every single thing about this waffle maker is about to be presented to you! There are many features of Breville BWM520CRN the No-Mess Classic Round Waffle Maker that makes it stand out. This waffle maker is a quality round appliance with dimensions of 11” x 9″ x 5 ¾” and has a weight of around 6.7 lbs. This Breville waffle maker comes in cranberry red, so if you are one who is about aesthetics, you are sure this waffle maker will brighten your kitchen space and get second looks. Breville BWM520CRN the No-Mess Classic Round Waffle Maker has baking plates made from die-cast aluminum. The capacity of this waffle maker is one 6.5” circular waffle. Breville BWM520CRN the No-Mess Classic Round Waffle Maker operates on 110 – 120 Volts and 900 Watt. This Breville Round Waffle Maker has innovative thermally engineered heating plates that ensures even heat distribution. This means that the days of uncooked waffles interior are over. Talking about indicators, this Waffle Maker has sound and light indicators. There are two light indicators – the first one shows power and the second one indicates when this Breville waffle maker is well preheated and is ready to bake. The beeping sound is heard twice – when the waffle maker is ready to take in batter and when the waffle is ready. Breville BWM520CRN the No-Mess Classic Round Waffle Maker accounts for safety with its secure lid lock mechanism. Waffle cooking plates are usually very hot, so what this ensures is that the lids are locked, preventing accident. The cook plates of Breville BWM520CRN the No-Mess Classic Round Waffle Maker are non-stick. Your health is also taken into consideration in the design of this cook plates as they are PFOA and Teflon free. While this waffle maker can only produce classic waffles, there is an option for customizing the color of the classic waffle. There are seven different adjustable color settings, each providing a changed heat level to your waffles. If you bake waffles, you would know that one major problem in regular waffle makers is overflowing batter, which causes mess. Breville has solved this in a very innovative manner with a wrap-around moat design. This moat design not only captures run-off and excess batter, but also bakes them, providing you with extra waffles to munch on. This moat design also simplifies the maintenance and cleaning process of Breville BWM520CRN the No-Mess Classic Round Waffle Maker. Since this is a newer product, there is only one customer review on Amazon. Still, it’s a 5 star review! The customer mentions that they have other Breville products and happen to love them. We agree! This waffle maker can be compared to the Cuisinart WAF-F20 Double Belgian Waffle Maker and Breville BWM520XL The No Mess Waffle Maker. Breville BWM520XL The No Mess Waffle Maker has the exact same specifications and features of Breville BWM520CRN the No-Mess Classic Round Waffle Maker. Their only difference lies in their colors. While, the BWM520XL is stainless steel, the BWM520CRN is cranberry red. They both cost the same. 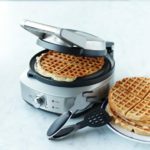 Cuisinart WAF-F20 Double Belgian Waffle Maker only makes Belgian waffles, compared to the Breville BWM520CRN which only makes classic waffles. They have the same number of adjustable color settings, and several other similar features. The Cuisinart cost significantly less, though!. Q – What type of waffles can this product make? A – This waffle maker can only make classic waffles. Q – How loud is its beeping indicator? Q – Does this product have a warranty? A – Yes, this waffle maker has a one year warranty. The Breville BWM520CRN is built with aesthetics in mind, all without sacrificing quality. If you are looking for a budget waffle maker to buy, then this might not be for you. Perhaps the another drawback is that it can make only classic waffles. If you are looking for a Belgian waffle maker, then the Cuisinart could be the one for you. Choosing between the Breville BWM520XL and this BWM520CRN depends on your aesthetic appeal. One thing is certain though, the Breville BWM520CRN will give you more than enough value for your money.